I've spent a few hours over the past few days updating some training I originally put together 2 - 3 years ago on the subject of 'Dyslexia-Friendly Schools'. The updates were mainly centred around a desire to place more emphasis on dyslexia, and SEN in general, as an issue of diversity rather than disability. The articles below demonstrate this shift, the first one relating to the thought-provoking book 'The Dyslexic Advantage' by Brock L. Eide and Fernette F. Eide. It seems to me that we are at the beginnings of a shift in our thinking around 'learning difficulties' with a much greater emphasis on the multiformity of personality and ability. It occurred to me today that in a decade or so, if this blog is still around, it may well be looked upon as 'backward' in its perspective and vernacular, in the same way we now tut-tut at the era of the 'remedial class' and 'school for the maladjusted'. That said, I do think we do still need to focus much of our dialogue and resource creation around addressing the very real, and very much prominent, difficulties experienced by young people in the very particular and peculiar environments of schools. 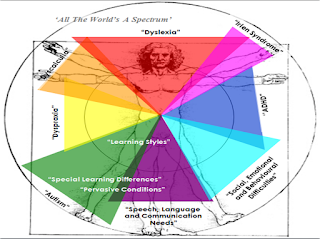 With dyslexia, this is primarily literacy, organisational skills and self-esteem. With autism, this centres around coping with a large, bustling, socially diverse and not always emotionally-healthy community. To ignore difficulty to dogmatically chase the notion of 'staying positive' would ultimately do a disservice to the student under the label. In terms of shift, it is also worth noting an item in the Daily Mail yesterday reporting on the prospect of huge cuts to the teaching assistant workforce in the UK. I admit to having very mixed feelings about this. I naturally have a strong loyalty to teaching assistants given I work with them closely in my role as SEN Coordinator. They work tirelessly and despite the weight of evidence, I maintain they do much to ease the life of vulnerable young people in schools (and in doing so, free up teachers), undertaking tasks that cannot be easily measured in terms of national curriculum levels - tasks such as making sure a student with blood sugar issues and weak memory eats his lunch everyday or ensuring a student having an anxiety attack calms down quickly to return lesson. The TA role also acts as a de facto internship for many graduates wanting to go into teaching and related professions such as social services. The Sutton Trust report into Pupil Premium funding kind of kicked off the radical rethink by deeming teaching assistants, as an intervention to raise achievement amongst cohorts targeted by the funding, to be both ineffective and costly compared to other interventions. However, there is a body of research - such as 'Reassessing the Impact of Teaching Assistant' by Peter Blatchford, Anthony Russell and Roy Webster - which has been growing for some time. It is a body of research that cannot be ignored. - Students with a high-level of TA support do even less well academically because of the presence / intervention of a teaching assistant. - This is not the fault of teaching assistants themselves, rather a result of the systems, common practices and cultures spawned over time as TAs have grown in number. - TAs should be trained sufficiently, in the theory and practice of teaching & learning, to act in an instructional role. TAs need to become a more qualified, specialist workforce. - TA and teacher communication about schemes of learning content, clear planned outcomes of their role, individual needs of students and so on needs to happen before, after and around lessons not ad hoc in the lesson. The TA role needs to more symbiotic with the teacher role rather than an blunt add-on. - TAs need to be coached specifically in 'learning conversations' with students rather than communication that 'closes down' and is preoccupied with task completion. Having read this article, I turned the page to find an article on the use of pupil premium funding, 'A good investment' by Gill Finch and Hugh Steele, which looks at how The Dale School used their pot of money to create an intervention team including a physiotherapist, speech and language therapist, a family support worker and several other 'specialist assistants'. I have long thought this kind of model would be more suitable than the current model. The bigger issue is changing the way Statements of SEN are written at LA level and the culture that has developed around it. For while ever Statements of SEN or equivalent personalised plans stipulate TA hours, schools will feel obliged to implement them and in turn, parents and carers will continue to demand their child's funding is spent in this way. It seems the two articles combined suggest a way forward for the role of the teaching assistant - perhaps fewer in number but more specialised and more autonomous. What also mustn't be forgotten is that if this is to happen, the pay scales of TAs will also need reviewing.